Former Maryland Governor Martin O’Malley spoke about the state of American politics at an event Sunday in the Marvin Center. Former Maryland Governor Martin O’Malley came to the Marvin Center Sunday to answer questions about his presidential run and the state of the country in an event hosted by the GW College Democrats. 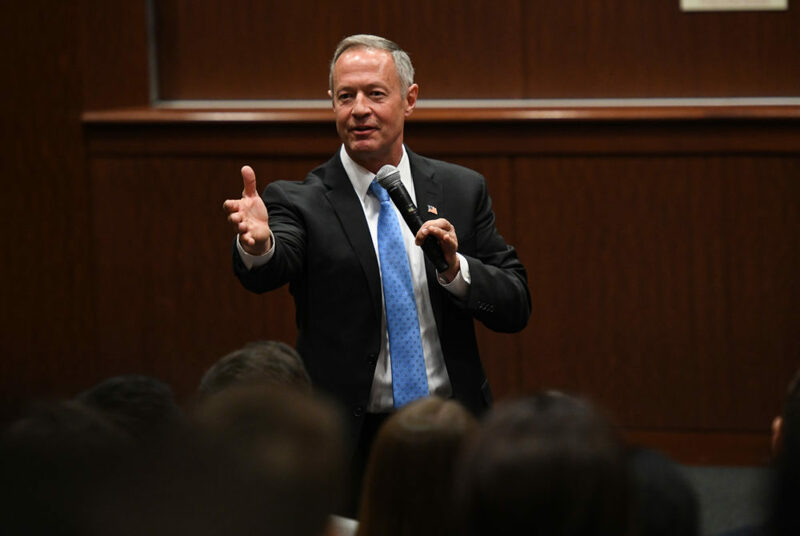 O’Malley spoke to more than 50 students about topics ranging from the changing Democratic Party platform to his role in campaigning for Democratic candidates in special elections nationwide. Speaking the day after hundreds of thousands rallied for a stronger gun control laws in a youth-driven march, O’Malley said he was hopeful about the country’s direction despite the current turbulent political climate. In an interview with The Hatchet, O’Malley said he wanted to persuade students who may have become disenchanted with politics following President Donald Trump’s election to focus on issues like climate change and gun control that he said the Trump administration has neglected. O’Malley said that during his time away from being a governor or presidential candidate, he hopes to focus on helping other Democrats win local elections, but he wouldn’t rule out another presidential run in 2020. “I’m keeping an open heart and an open mind about possibly running again,” he said. During his remarks to the College Democrats, O’Malley reflected on his experience running for president in 2016 and said it was “the toughest office to get elected to in the free world.” He dropped out of the Democratic primary race after the Iowa caucuses and later endorsed Hillary Clinton. He added that during his campaign, he was surprised by the anger voters across the country had toward the political system. Voters were likely disillusioned because many faced consistent job insecurity, O’Malley said. People with a high school education or less never saw their economic standing improve after the 2008 recession, even as politicians reported increasing levels of job growth and opportunity. But he added that voters are now looking for something other than anger in the candidates they support. O’Malley said the Trump administration has been a setback for tolerance and hampered racial equality, but he said he remains optimistic that the country’s core principles will remain intact.